After learning about the woodenware that the bees live in, now we are ready to learn about the actual bees themselves. Honeybee can be spelt as one word or two. Both are correct. It never ceases to amaze me at the number of beekeepers who actually know very little about honeybees. So let's start simple. There are three caste to a honeybee hive: The queen, the drones and the workers. A honeybee hive has only one queen per hive. The hive must have a queen in order to grow and survive. Without the queen they will perish. The queen is the only bee in the hive that lays eggs producing the next generation of bees. She lays between 1,000-3,000 eggs per day...yes, per day! The queen does have a stinger, but it is not a barbed stinger. She rarely uses her stinger, and usually only in fighting other queens that may emerge in her hive as virgin queens. It is very rare for the beekeeper to be stung when handling a queen. I am constantly picking up queens and have never been stung. Here is one of my queens. The white dot on her back is paint that I put there to help me easily identify her. The other bees have been trying to clean it off. Notice how the attendant bees circle the queen. This is called retinue. This is another helpful hint in trying to locate the queen. Rather than trying to spot her, try looking for the circle of bees around her, or observe the frame. The queen stays on the move and the other bees get our of her way. Next, we have the drones which are the male bees. Their only objective is to mate with a virgin queen. They differ in size and shape from the worker bee in that they are stockier, have larger eyes, usually appear slightly darker in color and do not have stingers. The will not and CANNOT sting you. They eat and wander around looking for a virgin queen. They are the only bee allowed to travel from hive to hive. They are important to have so that virgin queens can mate and begin laying eggs. Once the queen has mated with several drones during her mating flight, she will be able to lay eggs the rest of her life and will never mate again. Drones live around 90 days. In the fall, in colder climates, the worker bees will begin to kill the drones. They are no longer needed for winter, and they simply become a costly liability to the wintering hive. So, they are not allowed to winter in the hive, and die outside. In the fall, some beekeepers become concerned about the increased numbers of dead bees outside the hive entrance. A closer examination reveals these are the perishing drones who are no longer needed. Finally, the worker bee. Worker bees are all female and they do not lay eggs. 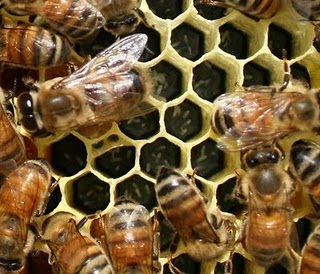 If a hive becomes queenless for 3-4 weeks, a worker bee might begin laying unfertilized eggs as a result of the absence of the queen's pheromone. However, this only produces more drones and will not help a dying hive. It is believed that this is one of the last things a dying hive can do, produce drones to mate with other queens. 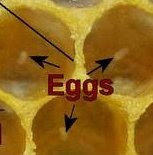 It is easy to spot eggs laid by a worker. There is usually more than one egg per cell, and they are seldom at the bottom of the cell since the worker bee is shorter than the queen and cannot drop the egg on the bottom. The worker bee will work in the hive until she is around 21 days old. Then, she is rewarded her wings and begins foraging for nectar, water, pollen and propolis. In the summer, she will work herself to death, usually only living 35-45 days. Next, we will examine how long it takes the drone, queen and worker to hatch and what they do in the hive. :) looking forward to learn more from you. What Are Wax Moths & Why Do They Bother Hives?